Have you ever considered Christmas from the perspective of those who lived it that first Christmas? It is relatively easy for us to look back and understand what was going on. We have the benefit of 20/20 hindsight. I think because of this, we miss the anguish and uncertainty that Joseph and Mary were walking into. Besides, it isn’t that hard to handle uncertainly in other people’s lives; only our own, right? What if the message of that first Christmas, and those who played a part in that great script, became personal to us? What if, instead of us being asked to be observers in God’s Story, we were asked to be participants? Would we want to be a part of His story then? Control is a big thing in our day to day lives. We have a script we typically run with each day; out of bed, go to work, come home, sleep, and begin again. It is all pretty predictable and safe. Not much in our lives is ever left to chance. This is okay I guess, but let me suggest something to you- Predictability and control may be two of your greatest enemies for following God’s plan in your life. 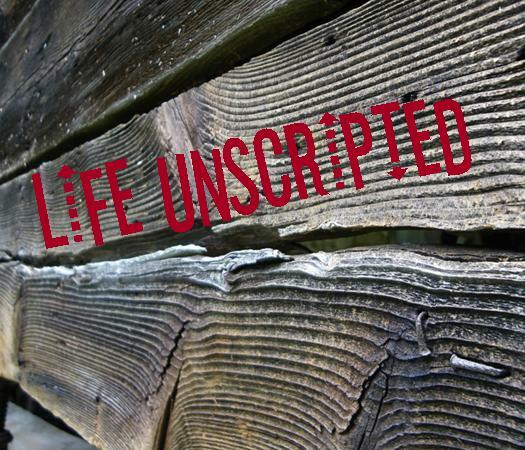 You see God is not predictable and those who follow him have to be willing to live a Life Unscripted. Often the control we want in our lives day to day, stands in stark contrast to what it means to follow God’s plan for us. We so often talk about wanting to know God’s plans and purposes for our lives. The only problem is God’s plans don’t come with a well controlled script and he doesn’t reveal all his plans to us before we sign on to following Him. No, following God’s plans for our lives requires a trust that, indeed he will be true to his promise to love and be with us as we walk with him no matter what it looks like. When we follow God our lives are scripted by Him but that will feel completely unscripted to us. The bible says followers of God “live by faith, not by sight” 2 Cor 5:7. It doesn’t get more unscripted than that. In tomorrow’s post we will see how that was true for Joseph.